Price’s brother and sister-in-law, Chase and Heather, gave us The Great Salsa Book by Mark Miller last Christmas. I have always refered to it when we are doing tacos but I always remember we have it at the last minute and it turns out we don’t have cilantro, limes, etc. The book has so many type of salsa, from mild to hot, pepper to fruit and more! On Friday I saw tomatillos at the grocery store so I picked them up knowing its Now or Never! I’m glad I got them because we made the Tomatillo- avocado Salsa and it was simple and the outcome was fantastic! I love salsa verde but this was the first time I have ever used tomatillos in cooking. This recipe got me so hooked that I was discussing growing them, if they will work in our zone 6, next summer. The one thing that was a bit off-putting about the tomatillos was how easy they bruise and that once you removed the husk they were kinda sticky. It took a bit of washing to that sticky substance off the tomatillos and my hands. The recipe was easy to follow… blend in food processor! We dont have a food processor so I used my Magic Bullet which I think resulted in the same result had I used a food processor. We cut the recipe in half since it is just the 2 of us, and even then it lasted 2 meals. Rinse and cut the tomatillos. Pit and chop the avocado. 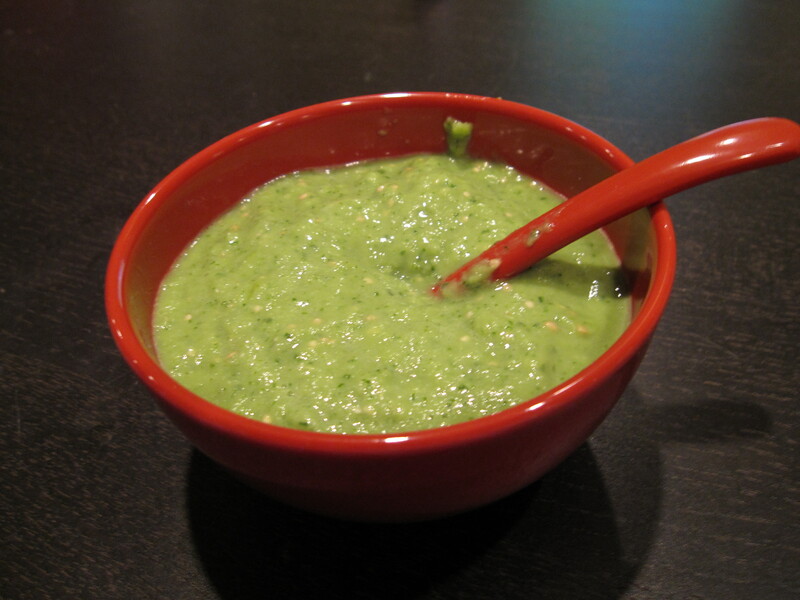 Combine all ingredients into a food processor or blender, and puree. The salsa was smooth and creamy. I could not find a serano pepper like the recipe called for so I used a fresh jalapeno. It had a good amount of heat. We ate it with taco and some chips. I really suggest this book for people who like Mexican of New Mexican foods. It has a wide range of salsas so you can be sure to find something that will work for you. The book has beautiful photography to so you can have a great preview of what you will be making. Up next is going to be a sun dried tomato salsa! On a side note, I was really excited to learn tha Mark Miller used to own the Coyote Cafe in Santa Fe. My mom and I went to Santa Fe in Oct of ’07 and we ate there. The food we had there was amazing, along with all the other places we ate.